Everything you need to know about services, funding, and outcomes. Extensive experience working with a variety of insurances and public agencies. Driven to support success in recovery while providing unwavering support through peaks and valleys. Full spectrum of care including residential, outpatient, day treatment, counseling and prevention services. Treatment by accredited multidisciplinary team that provides constant support no matter what. Services available in Menomonie and River Falls, WI. This form is encrypted for secure and confidential submission. What would you like to refer your client to? Arbor Place can follow up with me for more information. We promise to support your client every step of the way. We work with every patient to determine funding options that are available. We work with dozens of insurers and public agencies every single day and navigate the complex healthcare system so your client can focus on getting well. 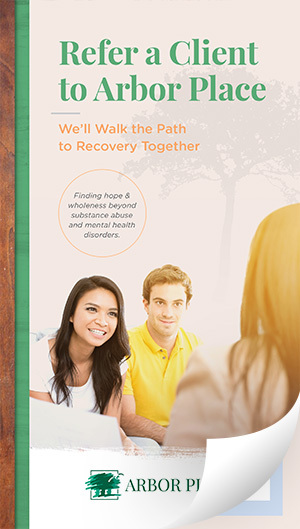 We help patients with various drug, alcohol and mental health disorders find the option that fits their life situation and treatment needs. Some need day treatment or residential treatment while others benefit from counseling or family therapy. Helping real people find freedom is all we do. In our family therapy program, for example, the program we use has been proven to reduce cannabis and alcohol use in teens by 42%, reduce delinquency by 47% and improve grades by 31%.